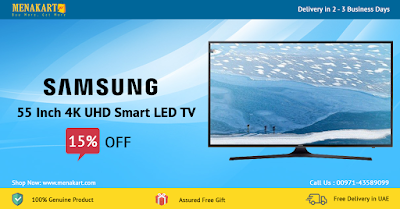 Enjoy watching 4K UHD media at its best by bringing home the Samsung 55KU7000 55inch 4K UHD Smart LED TV. The size of the TV has been dramatically slimmed down so that nothing stands between you and your high definition viewing experience. It sports a classic black finish and futuristic design that bodes well with your home decor. With technologies such as the Micro Dimming Pro and the Wide Color Enhancer, this Samsung 4K TV shows High Dynamic Range content in its absolute glory. It brings a fuller spectrum of hues to life and allows you to play UHD media that looks 4x sharper than Full HD. The Samsung 4K TV reviews talk about its preloaded Tizen operating system that provides you with a flawless user interface as well as access to a multitude of apps and functions. It houses a Quad Core processor to run every app effortlessly to its utmost potential. Integrated 802.11ac WiFi connectivity lets you access the Internet and stream online media content.